Habitat: Just about anywhere in tropical areas, with a preference for man-made structures. Length: To 5 inches total. Range: Due to international trade, now found worldwide in suitable climate zones. This gecko was one of about seven I found on the wall of my hotel in Hagatna, Guam. They congregate near outdoor lighting, where they feed on insects attracted to the lights at night. By day, the geckos hide in houseplants or in cracks in the buildings. 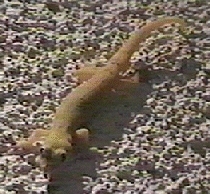 Geckos are unusual in the lizard world because they can vocalize.